This terrible story is just one of three shown in several tapes submitted to Amazon Watch, an environmental human rights non-governmental organization, by a Chevron whistleblower. For nearly a quarter of a century, the former oil company, Texaco (acquired by Chevron in 2001) has been under fire for having contaminated the Ecuadorian Amazon with millions of gallons of oil and toxic wastewater that has made its way into groundwater, rivers, and streams. The results of the pollutants have been catastrophic to the environment as well as to the health of the people living in the indigenous communities. In 1993, a group of lawyers advocating on behalf of indigenous people in Eastern Ecuador, filed a lawsuit against Texaco over the toxins that the company had released into the Amazon. The attempt to bring Texaco to justice for what many believe to be one of the gravest environmental human rights abuses of the late 20th and early 21st centuries has proven to be anything but easy. It has been a long process that has evolved over the course of twenty-two years to include numerous lawsuits and appeals involving four different countries and millions of people, with an end nowhere in sight. It is an uneven battle between Chevron and the indigenous inhabitants of the Ecuadorian Amazon. The oil giant's more than $200 billion USD net worth provides the resources to continue in litigation until, as one Chevron spokesman has said, "…Hell freezes over--and then…fight it out on the ice." [ii] Despite the immense disproportionality in monetary resources, the people of Ecuador have overwhelming and powerful global support, perhaps giving the global audience a preview of how this David and Goliath-esque battle may end. In 1993 and 1994, two separate grievances were filed against Texaco in US federal court. Both were class action lawsuits alleging that between 1964 and 1992 Texaco's oil operations polluted the Amazon rainforests and rivers of Ecuador and Peru, the two regions where the plaintiffs of the cases were located. [iii] However, in 2002 the US courts dismissed both lawsuits on the grounds that the South American courts would be a more appropriate venue for the litigation of the claims. [iv] Texaco agreed to jurisdiction in Ecuador and/or Peru, most likely under the assumption that it would be able to get away with its crimes in the South American countries. Chevron has also made the claim that the $9.5 billion USD rule against it was "ghostwritten," an allegation that a litigation document was obtained by Zambrano via USB drives, rather than having been thoughtfully and meticulously written out. However, this allegation has been proven false in the recent weeks. A leading computer forensics expert, J. Christopher Racich, found that the 188-page Ecuador judgment was written over a four-month period, ultimately leading up to the ruling. [xiii] This discovery directly contradicts Chevron's testimony that one of the Ecuadorians’ lawyers gave the judgment to Judge Nicolas Zambrano in late January 2011, just days before the judgment was issued. [xiv] Chevron's failure to produce the serial numbers of the USBs in question has added to the already strong sentiment that the corporation has been falsifying evidence, and has fueled the desire of Ecuadorian villagers to use Racich's forensic report as an aid in their other lawsuits against Chevron. The indigenous communities' protest is in response to Chevron's request that the ICSID hold a hearing to pressure Ecuador, instead of Chevron, to pay the $9.5 billion USD that Ecuadorian courts ruled should be paid to the victims of Chevron's spills and contamination. [xvi] This request by Chevron is a further injustice toward the indigenous communities of Ecuador, who have already endured so much and it has ignited not only Western hemispheric support, but global support as well. Amid the arduous effort of the people of Ecuador to bring Chevron to justice, global support from various non-governmental organizations and environmental human rights organizations have harnessed an interesting new method that they believe will pressure certain big corporations to turn from their chronic irresponsibility and move toward establishing responsible practices. The key? Rattling corporations' reputations. At the Public Eye Awards ceremony in Davos Dorf, Switzerland, Paul Paz y Miño, of the U.S-based environmental and human rights group Amazon Watch--the organization that nominated Chevron for the prize--referred to the corporation as "a recidivist toxic polluter that deserves condemnation from the world community for its horrific acts against the vulnerable indigenous peoples of Ecuador. "[xviii] That condemnation has become stronger in the last year with Chevron's newest dishonor as well as the growing suspicion that the corporation has falsified evidence in this seemingly never-ending litigation. The uneven battle between Chevron and the indigenous populations of the Ecuadorian Amazon has persisted for more than two decades with Chevron having been the clear winner thus far. However, the oil giant's Goliath of monetary resources seems to be buckling under the pressure of the Ecuadorian Amazon's David, fueled by global support and undeniable evidence. As Amazon Watch's Paul Paz y Miño's put the matter, "Chevron deliberately caused a lifetime of suffering and death by polluting the Ecuadorian Amazon to increase its already high profits to obscene levels. Chevron has also inflicted years of abusive lawsuits designed to leave affected communities defenseless and has tried to win by might what it could never win by merit." 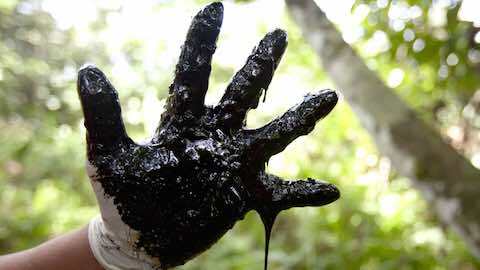 It is past time for justice for all those harmed by Chevron's greed and irresponsibility. "David and Goliath in the Amazon"